Almost everyone wants a beautiful smile. Crooked teeth can really detract from the beauty of the smile, but even more important, they can also be more difficult to keep clean and free of decay. Inadequate cleaning can eventually lead to gum disease, so straightening teeth is important for both aesthetics and oral health! The problem with straightening teeth is many people are turned off by traditional metal braces. It’s understandable, while traditional braces are effective; they are not very aesthetic and can often be uncomfortable or even painful for some. Invisalign braces are a clear alternative to metal braces that offer patients a number of other benefits. Here are some of the reasons North Hollywood patients love Invisalign. Let’s face it; metal braces are just not attractive. Adults having to pick food out of their braces at a business meeting would be awkward. Invisalign trays are clear and virtually unnoticeable. The clear aligner trays blend in with the dental arch and are much less distracting than other types of braces. Invisalign clear aligner trays can be removed when needed. Metal braces are attached to the teeth and they remain in place until removed by a dentist. Invisalign trays can be removed for short periods to eat or clean the teeth. In addition, the BPA-free smooth plastic is more comfortable than metal brackets and wires. Traditional metal brackets and wires can scratch or cause sores inside the cheeks and on the gums. There is also the issue of tooth decay or demineralization of teeth due to difficult oral hygiene. 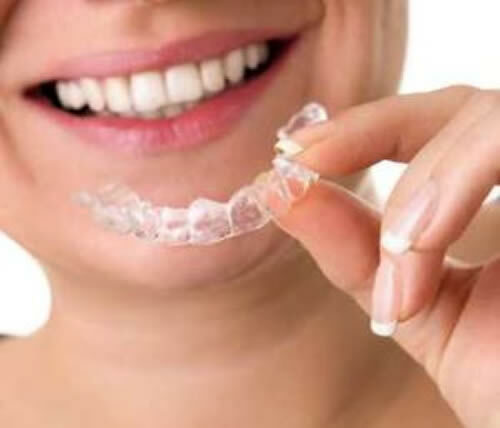 Clear aligner trays can reduce the wear and tear on the mouth. Treatment with traditional metal braces can take 2 or 3 years. While Invisalign treatment duration varies by the individual, most patients achieve optimum results within about 18 months. The key is compliance. Patients who do not wear the aligner trays the recommended 23 hours a day will not see as dramatic results. To learn more about a faster, convenient way to a straighter smile, call your North Hollywood dentist today for more information on Invisalign.